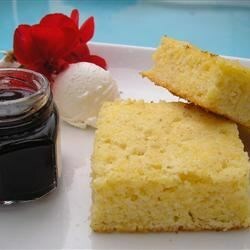 "This is a recipe from my hometown of Sarajevo, and it is similar to a southern cornbread. What makes it unique is the addition of semolina flour (or Cream of Wheat®). If you don't have semolina flour, you can just replace it with additional corn meal. This recipes also makes excellent muffins." Preheat an oven to 400 degrees F (200 degrees C). Butter an 8x8-inch baking dish and sprinkle 1 tablespoon cornmeal over the bottom of the dish. Sift the all-purpose flour, semolina flour, 1/4 cup cornmeal, baking powder, and salt together in a bowl. Whisk the eggs, buttermilk, and vegetable oil together in a separate large bowl. Mix the flour mixture into the egg mixture until just combined; don't overmix. The batter should be pourable; add more buttermilk as needed to get the right consistency. This is very bland cornbread. But with a lil grape jam it is awesome. Not to sweet!